I love participating in the Virtual Paintout each month. 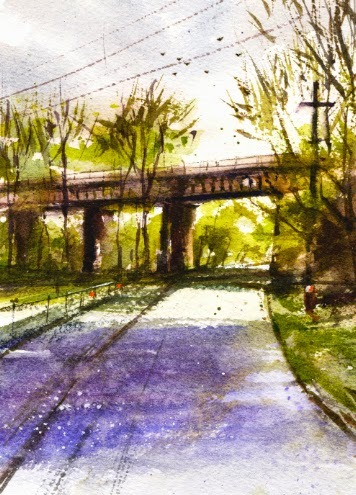 For January 2015, the location was Philadelphia, PA, chosen by Bill Guffey, creator and leader of the Virtual Paintout. It seems there is never enough time to virtually look around the chosen city or country. 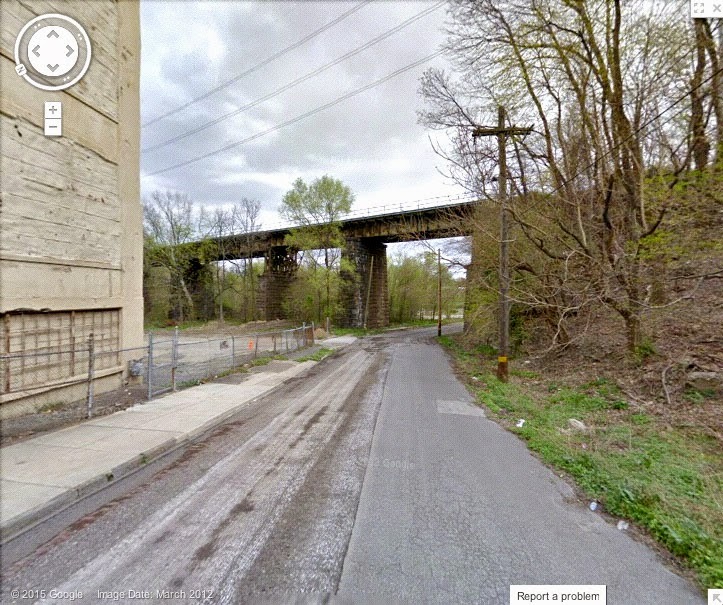 The Philadelphia area had many cites and different types of scenery. Lots of good subjects. I found an industrial location with tanks and stacks that I like to paint but I kept looking for something more descriptive of the city. 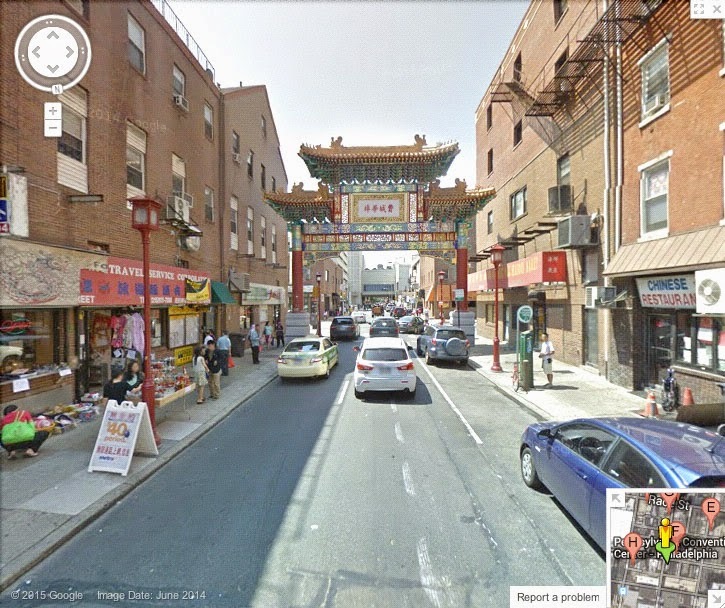 I happened upon Philadelphia's Chinatown which had a beautiful, ornate gateway. 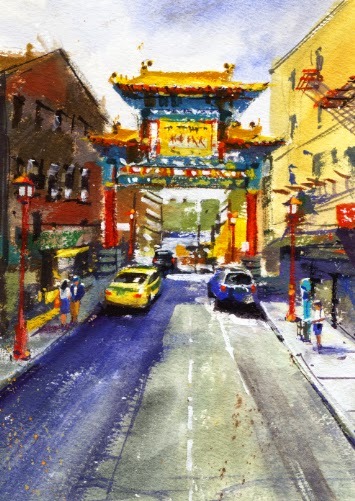 It reminded me of the one I painted for the Virtual Paintout in Washington D.C. of the Chinatown gateway there. I like to try two pieces, one watercolor and one gouache. Looking forward to next month as always. Would you believe I've been looking forward to painting at a local respiratory hospital?! I know, what an unlikely painting subject. Barlow Respiratory Hospital, originally a TB sanatorium, was established over 100 years ago by Dr. Barlow, a TB patient himself. The dry, sunny Los Angeles climate attracted him to the hills of Elysian Park. Besides the hospital, on the 25 acre property, there were many cottages situated for maximum fresh air. Some larger cottages were built by the Red Cross in 1919. Amazingly, the hospital is now a long-term care facility, and the cottages remain, mostly in a state of disrepair. The hospital is very close to downtown Los Angeles and next door to Dodger Stadium. 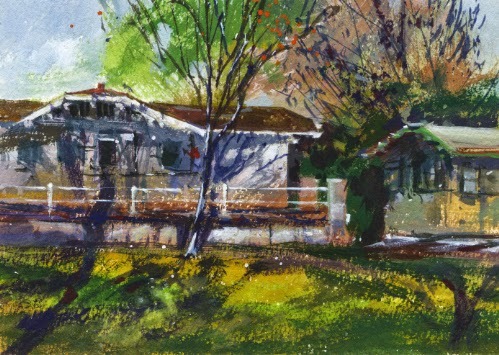 Of course the vintage craftsman style cottages are attractive to us plein air painters. Unfortunately, Barlow is proposing to demolish a majority of the buildings and replace the hospital. The rest of the site is to be subdivided to build hundreds of condos. It's such a unique place that we thought a paint-out there needed to happen soon. It was a cold, wintery Saturday. Our group really enjoyed looking around the property, trying not to intrude. I painted a gouache piece from a large lawn area, capturing the feel of the winter light. We hope to return before Barlow is changed completely. Last month I had the opportunity to get a spot in a 3-day workshop given by Keiko Tanabe at the NWS headquarters in San Pedro. 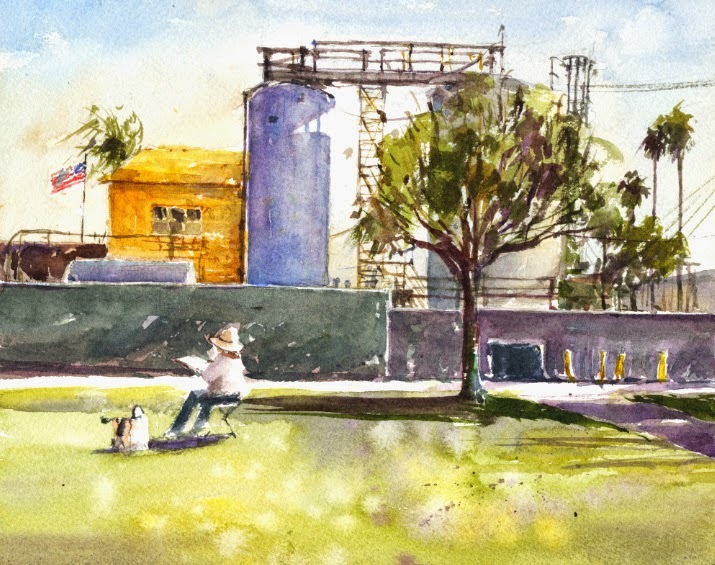 Keiko is one of my favorite plein air watercolor painters. I was really looking forward to being able to watch her paint again and absorb some of her expertise. I took a workshop taught by Keiko two years ago when I was first starting plein air painting and enjoyed it so much. She is so generous and such a lovely person. Our first day was in the studio and we all tried painting from Keiko's photos. She did morning and afternoon demos and we tried the same scenes of Italy and San Clemente, CA. 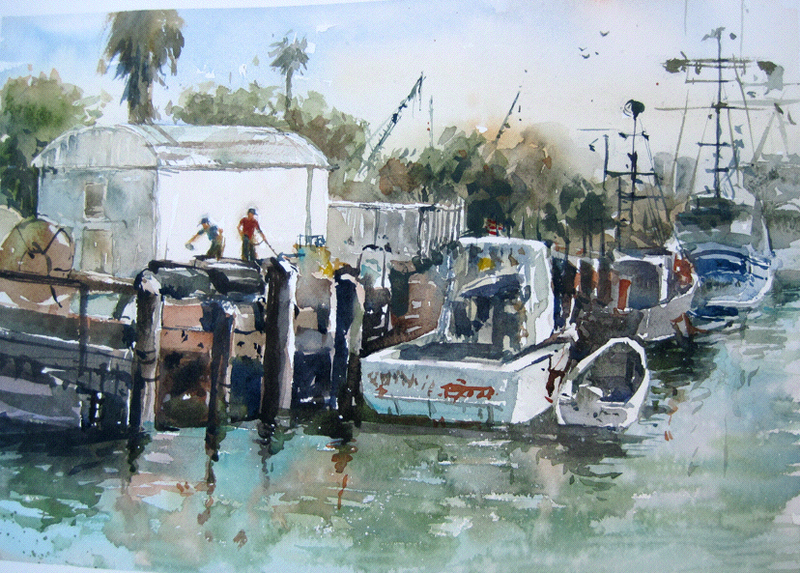 The next day we met at the harbor for some outdoor painting. We had a fun morning watching Keiko paint and then trying the working harbor scene ourselves. I've mentioned my painting of water and boats needs more practice...still does! In the afternoon we painted in another area at the harbor and I found something without boats and water to try, a more "industrial" scene that I enjoy. On the final morning we met at Averill Park which is a beautiful place. There is a stream with ducks, trees, and dappled light creating a wonderful mood. In the afternoon we went back to the studio to watch Keiko paint another demo. She's just so quick and amazing. Very inspiring! A diver doing repairs who was surprised to see us . Arlington Garden in Pasadena is always a wonderful place to visit. The Saturday paint-out group was there recently to check it out in January. Since my last visit, a lot of work had been done on the flower beds and pathways. The area where the red poppies bloom in the spring had some poppy leaves popping up. Two of my paintings of the red poppies were in The Red Poppies! 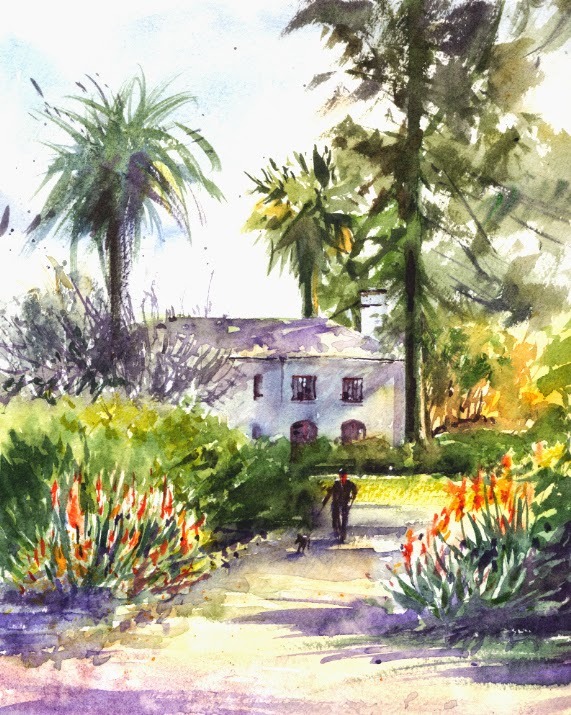 Of course all the plein air groups are looking forward to spring at Arlington Garden this year. I thought the winter light at the garden was beautiful. There was a spectacular view of some backlit trees with their fall leaves but I couldn't find a good spot to paint them from. I settled on a walkway with a view across the street with some aloes in bloom at the entrance. Aloes are native to southern Africa so they bloom in our winter time. They were a nice pop of color for January. 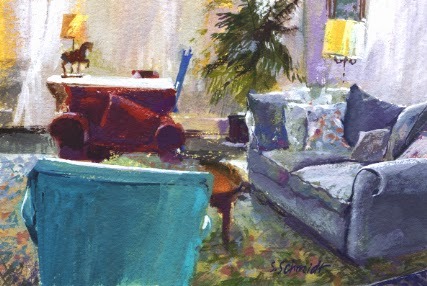 When I first saw Sara's living room, the homeyness, colors, and light were beautiful! It looked like a painting I needed to do. I took a photo in the hope that I would actually try a painting. Over a year later I tried this gouache piece, my first interior. With the sunlight pouring in the two windows, my photo was overexposed, washing out the light details. As I painted, I kind of liked the blown-out highlights. I might have tried adding too much detail in the drapes and windows. I also thought about the idea of actually painting this in person, sitting in Sara's living room. It would be much harder for me. With the photo, everything was already flattened for me into two dimensions! Of course this would be true with painting outdoors as well. But for me it's the opposite, preferring painting en plein air over a photo of the scene. I loved painting this and would like to try more interiors. I was back at the beautiful Pasadena Museum of History last month with one of the paint-out groups. We only had a short time to paint since we were there to see the show Contemporary Masters, Artistic Eden. Some artist friends had paintings in the juried show so we had to check it out. The museum is housed in a 1906 mansion with beautiful surrounding grounds. 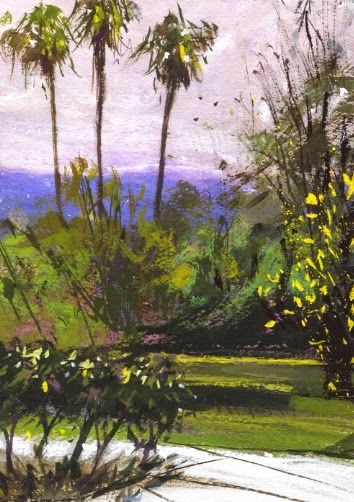 The day was overcast and dreary and I was looking for a bit of sun and shadow for my view to paint. I didn't quite find any sun but I found a nice view of some pathways, trees, and mountains. It turned out that the spot where I was sitting at the top of the property, was what I had painted two years ago on my first paint-out there. Looking at that previous watercolor, Another Museum!, this time I was sitting in the light area between the two hedges. I tried a gouache piece since I paint them smaller and they dry more quickly. Just finished in time for our discussion before the show. My recent post Casting Practice reminded me that I never finished a piece from November 2013. 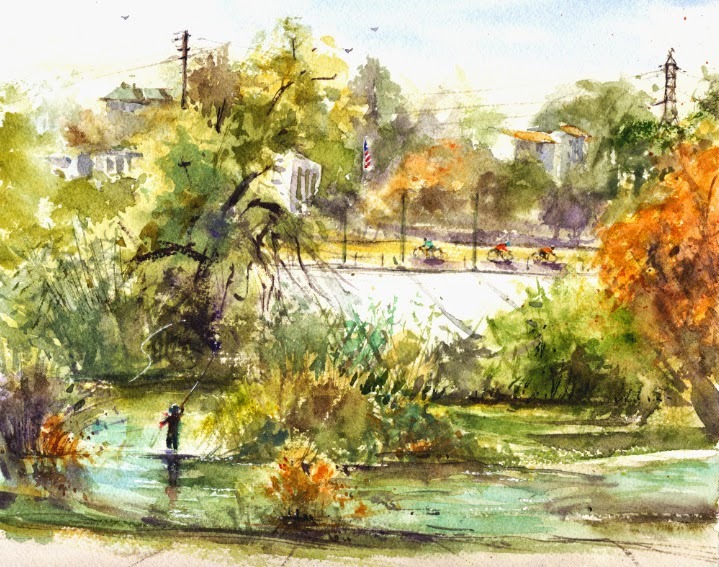 Our Saturday paint-out group was at the Los Angeles River to paint. When we arrived it was kind of exciting to see a man wading out in the river and doing a lot of casting. There was a photographer shooting the casting session. The photo shoot might have been for an ad or a school project. 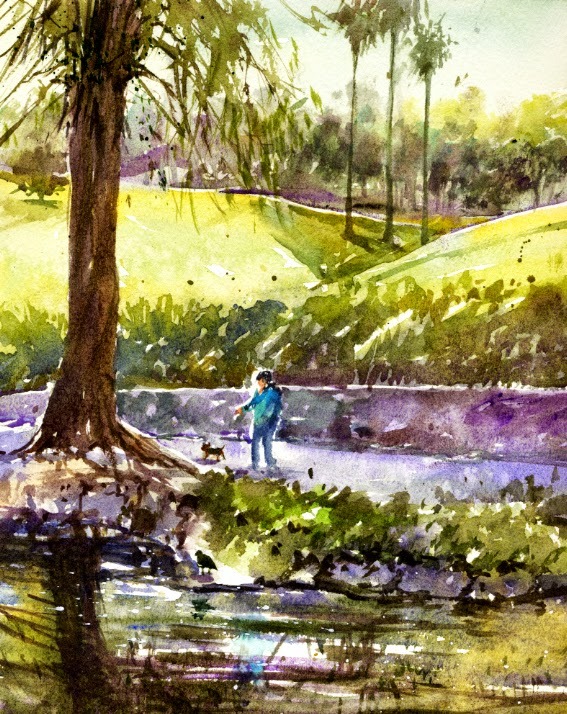 I hadn't finished adding the fishing pole and line in this watercolor until I painted at the Pasadena area casting pond and got a better look at more casting action. My most recent visit to paint at the river was in March and I shared that watercolor in L.A. River Ducks. It will be fun to visit again to see the ever-changing river. 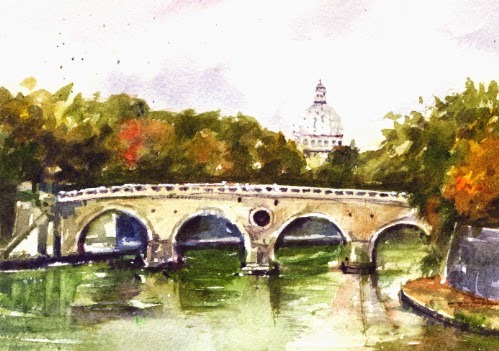 For the December 2014 Virtual Paintout Bill Guffey chose Rome, Italy. 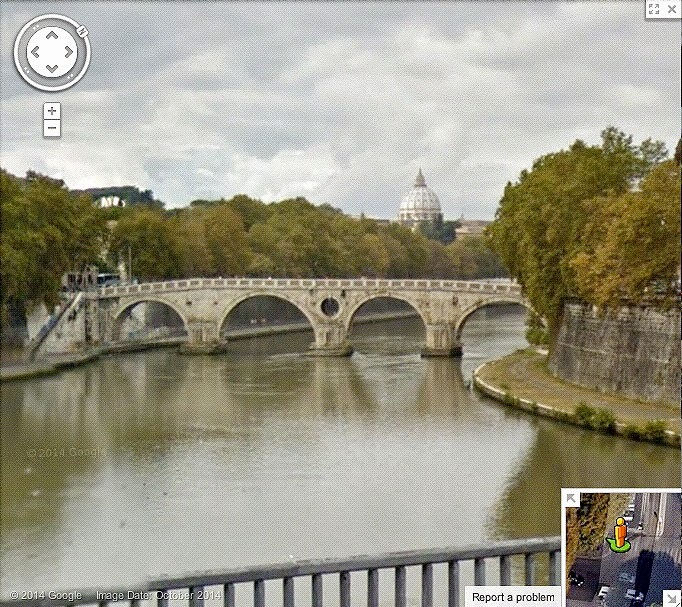 Artists use Google Street View to look around and find a view they would like to paint in the month's specified city, or area. Anyone can join in and submit a painting to Bill who puts them on his blog and on Facebook. Rome was an exciting place and a challenge for me. I found it difficult to find a spot that didn't have many many cars blocking the view of what might be nice to paint. Of course I try to find something to paint that is a little reminiscent of the location. 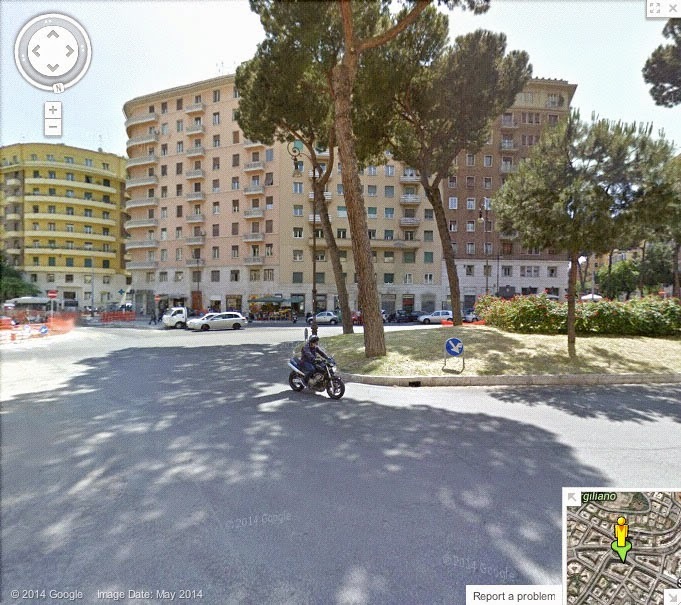 In Rome I could look from a blimp's-eye-view of a quaint-looking street, but then when I went to the street view it would be jammed with cars. There were also many interesting streets lined with walls. Not so picturesque. As always, I wished for more time to look around. Looking forward to next month!